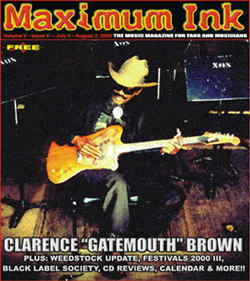 On stage, Clarence “Gatemouth” Brown isn’t much of a talker - he makes most of his statements with his guitar and fiddle. With more than 50 years in the business, Brown’s kettle-stewed blend of influences harvested from his Texas/Louisiana home base have cooked down to a self-defined “American Music” - blending jazz, country, blues, Cajun, folk, R&B, and big band. Off-stage, he’s also usually parsimonious with his comments. But he does have his trigger points. Although the spry 76-year-old Brown is still in better health than many of his contemporaries, the question of retirement is one that’s natural to ask. Just don’t expect an answer. “Well, I guess that covers all the questions you needed to know,” he elusively responded. Brown was equally mum on future musical plans past the current tour. “You’ll just have to wait and see,” he said. The Gatemouth Brown of few words had re-emerged.